If you’re off balance, try sinking deeper into the imaginary chair behind you. This seems counter intuitive, but lowering just an inch (or two!) more can help you find your center of balance better. 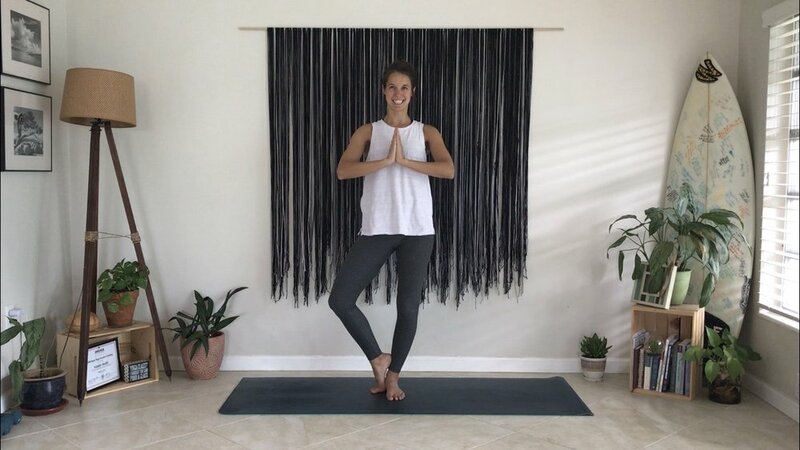 You can also try changing surfaces (step off of your mat onto the bare floor) and finding a focal point in front of you to focus your gaze (these are great tips for any balancing pose). Keep your hips and shoulders square to the front of the room. It’s OK if your arms don’t wrap around or your toes don’t go behind your calf! Focus on proper alignment first before trying to go further (this helps you to avoid unnecessarily hurting yourself as well). If you would like to feel a stretch through your shoulders and upper back, work on bringing your elbows in line with your shoulders and gently moving your hands away from your face. If you fall out of the pose, laugh it off and try again! That’s the beauty of yoga after all - its a continual practice! Root down through your grounded foot by evenly distributing weight through the four corners of your foot. You can also imagine roots extending from your foot into the ground. If you’re feeling off balance, step off of your mat and try the pose on the bare floor. Some mats can provide too much cushion when it comes to balancing postures and sometimes it helps mentally to just try a different surface! Stand tall like a tree! Imagine a string going through the center of your body up to the ceiling to help prevent sinking down into your hip. As always, modify the pose to fit where you are in your practice! Modifications include placing your lifted foot on your ankle or calf (see below for examples and remember to place your foot above or below the knee, never on it), placing your hands on your hips or at heart center to help with balance, or standing next to a wall for additional support. 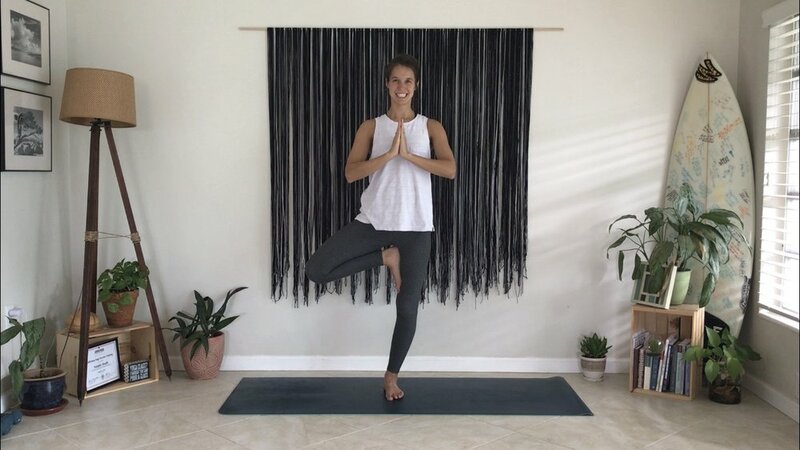 Once you feel comfortable in this pose, you can always further it by reaching your hands toward the ceiling and maybe, just maybe, closing your eyes - as long as you are in a safe environment where you can catch yourself if you start to fall! Example of tree with the raised foot placed on the ankle. You can use your raised foot as a kickstand to help with balance. 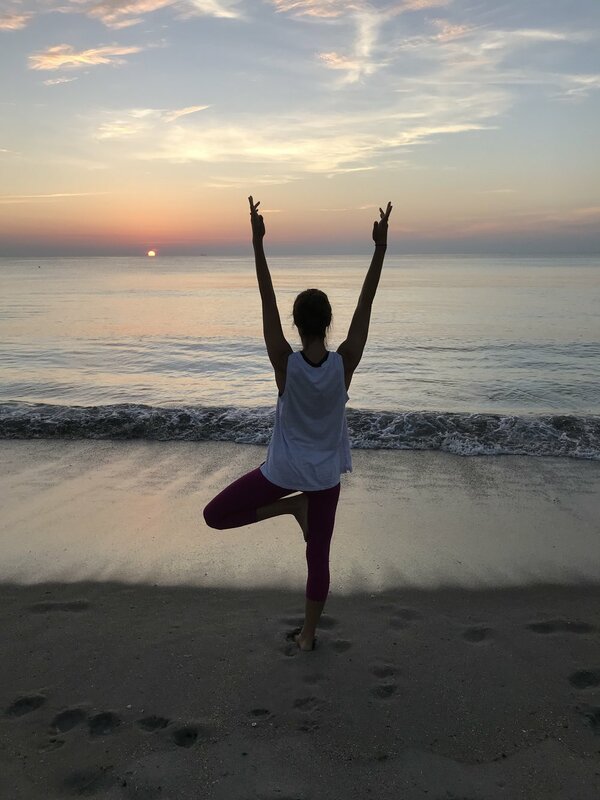 Example of tree pose with the elevated foot on the calf. When moving into Warrior III, hinge at your hips while keeping your leg, core, and arms engaged. This will help will balance and overall stability in the pose. Keep your hips square to the mat as you press your heel toward the back of the room and reach your fingers toward the front of the room. If your having trouble with balance or find that you’re dumping into one side of your body, try bringing your hands to heart center and adjusting from there. Find a focal point in front of you and softy focus your gaze on that point. This is often referred to as “drishti.” When picking a focal point, find something that isn’t moving. It can be as big or small as you like. For example, in the picture above, I am focusing on the horizon, specifically the line where the ocean meet the sky. My gaze is not moving around, but is steady straight ahead. Move off your mat. Sometimes our mats can give us too much cushion when it comes to standing poses. Your foot can’t properly ground down and it can make you lose balance. If this is the case, don’t rush out to buy a new mat, just step off to the side for those poses! Give these a try the next time you’re working on a balancing pose and let us know how they work for you! Don’t forget, our balance can vary day-to-day, don’t be too hard on yourself!